Plaster of Paris is a powder made from calcium sulfate that forms a paste when mixed with water. The paste then hardens and can be used to cast items in a mold. In school, children often make dioramas, miniature representations of a scene, as a way of displaying what they have learned about a particular historical event or cultural society. Plaster of Paris is a useful, albeit messy, way of creating landscapes or casting small figures for a diorama. Use sponges, newspapers and strips of cardboard to create the terrain for the diorama landscape. Ball up newspaper and stack sponges to create hills or mountains. Create gentle slopes, river banks and waterfalls by bending strips of cardboard into the appropriate shapes. Lay out the terrain in a shallow cardboard box or on top of a wooden platform. Secure all the pieces of the terrain to the box or platform with tape and craft glue. Cover the workspace and the floor with newspaper before beginning to work with Plaster of Paris. Cut paper towels into long, thin strips. Prepare a small batch of Plaster of Paris according to the directions on the package. Stir carefully to remove lumps from the mixture. Dip paper towels into the Plastic of Paris mixture and lay them over the terrain to create a hard shell. Work quickly, covering the diorama’s base with thin strips of paper towel soaked in Plaster of Paris. Allow the Plaster of Paris to dry completely before decorating the diorama. Cutting drinking straws into one- to two-inch-long pieces. Grease drinking straws with petroleum jelly. 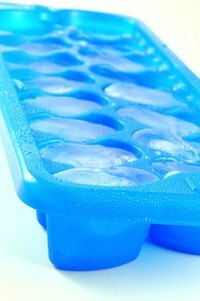 Grease the sides of the ice cube trays or shape molds with petroleum jelly. Prepare the Plaster of Paris mixture according to the directions on the package. Mix the paste in a plastic container. Stir carefully to remove lumps from the mixture. Mix a small amount of poster paint into the Plaster of Paris mixture. Stir slowly to evenly disperse paint through the Plaster of Paris. Choose a paint color that is appropriate for the type of shape being cast. Pour the mixture into the ice cube tray or plastic mold. Insert a piece of drinking straw into each section filled with Plaster of Paris. Be sure the straw reaches the bottom of the mold. Allow the molds to dry and use the straw to help remove the shapes from the mold. Repeat these steps for each new shape and color. Plaster of Paris often dries quickly. When covering the diorama's base, it is best to make a small batch and work with it until it begins to harden, then prepare another small batch and continue until the diorama is covered. Many stores sell ice cube trays in various shapes including animals, sticks and stars. Many of these shapes may be useful for making diorama decorations. Regular ice cube trays produce excellent rocks or cubes. Craft stores may have plastic molds in a variety of shapes that will work for this project. Plaster of Paris powder can irritate lungs if inhaled. Those with allergies, asthma or lung problems should wear a protective mask. Do not allow children to mix Plaster of Paris without the supervision of an adult. How to create a homemade dinosaur excavation kit using play sand, powdered plaster, water, play dinosaur bones and plastic utensils.